List 10 items that are essential to be carried on any backpacking trek and explain why each item is necessary. Describe 10 ways you can limit the weight and bulk to be carried in your pack without jeopardizing your health or safety. Define limits on the number of backpackers appropriate for a trek crew. Describe how a trek crew should be organized. Explain the purpose of an emergency response plan. Describe the importance of using Leave No Trace principles while backpacking, and at least five ways you can lessen the crew’s impact on the environment. Describe proper methods of handling human and other wastes while on a backpacking trek. Describe the importance of and means to assure personal cleanliness while on a backpacking trek. Demonstrate two ways to treat water and tell why water treatment is essential. Explain to your counselor the importance of staying well hydrated during a trek. Demonstrate that you can read topographic maps. While on a trek, use a map and compass to establish your position on the ground at three different locations, OR use a GPS receiver to establish your position on a topographic map and on the ground at three different locations. Explain the advantages and disadvantages of the different types of backpacking stoves using at least three different types of fuel. Demonstrate that you know how to operate a backpacking stove safely and to handle liquid fuel safely. Prepare at least three meals using a stove and fuel you can carry in a backpack. Write a plan that includes a schedule for a patrol/crew backpacking hike of at least 2 miles. Conduct a prehike inspection of the patrol and its equipment. Show that you know how to properly pack your personal gear and your share of the crew’s gear and food. Show you can properly shoulder your pack and adjust it for proper wear. While using the plan you developed for requirement 9a, carry your fully loaded pack to complete a hike of at least 2 miles. 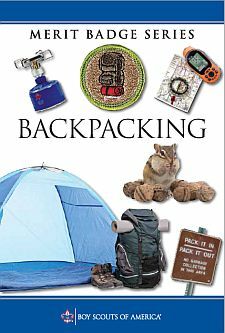 Write a plan for a backpacking trek of at least five days using at least three different campsites and covering at least 30 miles. Your plan must include a description of and route to the trek area, a schedule (including a daily schedule), a list of food and equipment needs, a safety and emergency plan, and a budget. Keep a daily journal during the trek that includes a day-by-day description of your activities, including notes about what worked well and thoughts about improvements that could be made for the next trek.